Sweden is one of the teams that have a legitimate shot to take home the gold medal in Buffalo. The 2018 World Junior Championships are less than a day away, and the Swedes are truly poised to win it all. In many ways, they are in the best position possible. Most of the medal discussion is geared towards either Canada or the USA winning the gold – what prime positioning it is, then, to be the legitimate contender that no one is talking about. There’s less pressure on the Swedes, thus making them evermore dangerous. Sweden is strong from the crease on out. Their offensive firepower can match that of Canada’s and the USA’s whether you like it or not. They have speed, they will not shy away from physical play, and they can fight fire with fire if called upon to do so. This is especially the case now that the Buffalo Sabres have permitted the Swede’s top scorer, Alexander Nylander, to temporarily forgo his spot with the Rochester Americans to partake in the games in Buffalo. Olle Eriksson-Ek (Färjestad), Filip Gustavsson (Luleå), Filip Larsson (University of Denver). The three goaltenders to make Sweden’s final cut are whom we believed they would be. Filip Gustavsson, Olle Eriksson-Ek and Filip Larsson have each been drafted by NHL teams. Gustavsson got the duties in net against the USA for Sweden’s preliminary game against the Americans in Erie, Pennsylvania. 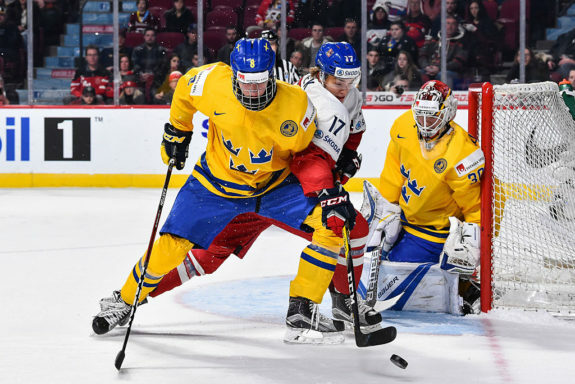 He has also received the bulk of the work for the Swedes in their other U20 contests leading up the main tournament in Buffalo. Gustavsson is a second-round selection of the Pittsburgh Penguins in 2016. At 6-foot-2 and 183 pounds, he is known for an exceptional catching glove. Gustavsson has been playing this season in the Swedish Elite League for Luleå where he has a 3.04 goals-against average and .887 save percentage in 10 games. He is likely to be the starter, and is also the only returning netminder from the 2017 WJC team. Top ranked European goalie Filip Gustavsson is today's @SportChek Prospect Profile. The University of Denver commit, Larson, was chosen by the Detroit Red Wings in the sixth round of the 2016 draft. Prior to this tournament, he has been in the midst of a remarkable season in the USHL. Manning the nets for the Tri-City Storm, Larsson has compiled a record of 14-4-0. What really stands out are his stellar 1.45 GAA to go with a .946 SV% in his 18 games. The most recently drafted goalie is Eriksson-Ek. The Anaheim Ducks selected him over the summer as a fifth-rounder. Eriksson-Ek was a silver medalist for Sweden at last year’s U18 championships. There, he appeared in two tournament games and posted a 2.01 GAA and a .889 SV%. Erik Brännström (HV71), Rasmus Dahlin (Frölunda), Linus Högberg (Växjö Lakers), Timothy Liljegren (Toronto Marlies), Gustav Lindström (Almtuna), Jacob Moverare (Mississauga Steelheads), Jesper Sellgren (Modo). The main cogs of Sweden’s D-men are really the “big three” – Rasmus Dahlin, Erik Brännström, and Timothy Liljegren, though all seven defenders are topnotch. Suffice it to say that defense is a strong suit for the Swedes. Dahlin is the player projected to be the top overall pick in the 2018 NHL Draft. And why not? There is everything to love about this young player. Even at the tender age of 17, Dahlin is an accomplished open-ice hitter. His passing is hard and crisp and he has a good shot. Dahlin’s finest attribute, though, is arguably his skating. He can jump into the play well and has marvelous acceleration. Brännström is part of the future of the Vegas Golden Knights. They selected him 15th overall this past summer. Brännström will be a leader on this hockey club too, as he has served as either a captain or an alternate for previous Swedish national teams at the U16, U17 and U18 levels. Liljegren was chosen by the Toronto Maple Leafs just two picks after Brännström. The Leafs wasted no time in getting Liljegren to their AHL affiliate, the Toronto Marlies. The youngest player on the Marlies roster, Liljegren has played quite admirably. The 18-year-old has appeared in 18 games, has two goals and five assists, and is a plus-six. Jacob Moverare is another top defender for Sweden. At 6-foot-2 and around the 200-pound mark, Moverare has been playing quite well for the OHL’s Mississauga Steelheads. Last year, during the 2016-17 season, he had a pair of goals and 30 assists in 63 games. Moverare also played in all 20 playoff games for Mississauga as they lost in the OHL finals. The Los Angeles Kings did well, and may have made out like bandits by selecting him in the fourth round of the 2016 draft. Lias Andersson (Frölunda), Jesper Boqvist (Brynäs), Marcus Davidsson (Djurgården), Glenn Gustafsson (Örebro), Axel Jonsson-Fjällby (Djurgården), Frederik Karlström (Linköping), Linus Lindström (Skellefteå AIK), Isac Lundeström (Luleå), Alexander Nylander (Rochester Americans), Elias Pettersson (Växjö Lakers), Oscar Steen (Färjestad), Tim Söderlund (Skellefteå AIK), Fabian Zetterlund (Färjestad). Alexander Nylander tied Russia’s Kirill Kaprizov to lead the 2017 World Juniors in scoring with 12 points (5 goals, 7 assists). 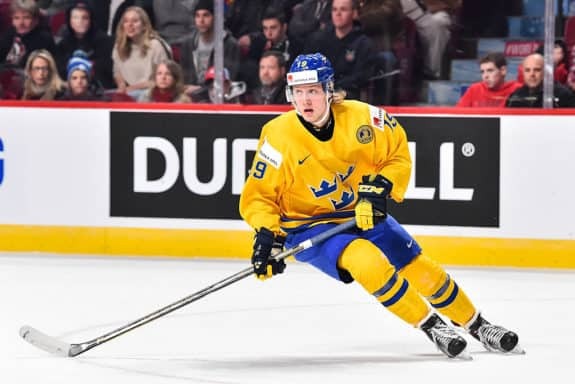 The return of Nylander is arguably the crux for Sweden’s chances at the gold. He was so good last year, and if he can produce at least the same level of performance this time around, then the Swedes are to be sitting pretty. With more North American experience under his belt now, and even a “hometown” crowd rallying behind him in Buffalo, Nylander could be the decisive factor in who wins this tournament. Thank goodness for Sweden that the Sabres allowed him to return, and a feather in Buffalo GM Jason Botterill’s cap. Glenn Gustafsson has played parts of three straight years in the Swedish Elite League with Örebro HK. He is a lesser-known player on this roster because he has virtually no North American exposure. With 61 games in Sweden’s top league, Gustafsson has six goals and four assists. At 5-foot-10 but over 200 pounds, he is a solidly built forward. Take into consideration too that Gustafsson has played with and against men who are nearly twice his age for more than two seasons now. That will prove helpful in this tournament. Like Gustafsson, New Jersey Devils’ 2017 second-rounder Jesper Boqvist has Swedish Elite League experience, playing for Brynäs IF. Although his scoring touch has not yet transferred over to this top league – he has a goal and eight assists in 28 games – he has been a dangerous scorer all throughout his junior career. With stop-on-a-dime skating, Boqvist is very shifty and will routinely beat opposing players in one-on-one situations because of his skating. He will be a really fun player to watch in Buffalo. Sweden’s recipe for success may have been perfected here for the 2018 tournament. A fourth-place finish last year just did not cut it, and will not in Buffalo either. Truly, anything less than a gold or silver will be an instance of the Swedes not playing up to their potential. There is just too much talent and too much skill on this roster to come up short. Nylander’s return is the biggest help, but even if he had not entered back into the fold, this team is still good enough to medal. Now, there is no excuse whatsoever. The best intangible that Sweden has in their favor is a prevailing sense of being self-assured. Having Lias Andersson as their captain helps. Especially with Nylander, Brännström, and Moverare as the alternates. The majority of the Swedes are seasoned, either in previous World tournaments or playing beyond their years in their homeland. Confidence that coincides with their talent may be what they have needed more than anything else, and it appears that they do indeed have it heading into this tournament. Sweden will take home a medal. The color of the medal depends on how badly they want victory – they have the talent portion already covered.